The XK was the first Falcon released, and was based very much on the equivalent U.S. Falcon, copying its styling almost without change. 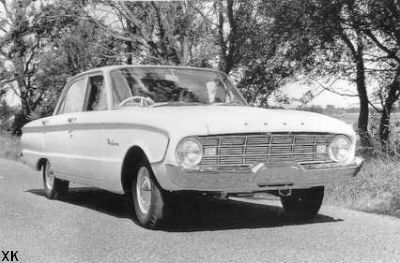 While fitted with robust mechanicals - a 144ci (2.4 litre) six cylinder engine and choice of three speed manual or two speed automatic - the U.S. designed suspension, especially at the front, was found to be fragile on Australia’s rougher roads, and warranty claims were so costly for Ford that there were rumours that production would be discontinued. But with the support of the U.S. parent company, the car survived. The XK was manufactured between September, 1960 and August, 1962. 68,456 were produced. The XL was introduced with some new styling changes, most notably to the grille, altering from a concave to a convex shape with recessed headlights and bumper mounted indicators. The tail lamps were revised and the rear roof line was changed to reflect Ford’s Thunderbird style theme. The most serious changes were made underneath with significant mechanical upgrades - a new gearbox, clutch, starter, air and oil filters - and an attempt to sort the weak front suspension without complete success. The XL was manufactured between August, 1962 and February, 1964. 75,765 were produced. The XM was another styling facelift of the original XK, with a much heavier and impressive front grille and, in a major break from being a derivative of the contemporary U.S. model, tail lamps raised to boot level height for greater visibility. As an indication of things to come, some ‘sportiness’ was introduced with a dummy air scoop on the bonnet, the introduction of a two door hardtop and the greater availability of the 121hp, 200ci (3.3litre) Super Pursuit engine. And finally, the front suspension troubles were cured completely with the use of strengthened components. The XM was manufactured between February, 1964 and March, 1965. 47,039 were produced. The XP was the last facelift of the original Falcon and featured an aggressive, squared off look to the front end and more solid styling overall. The development of the car over the years since its introduction paid off, and the XP was very well regarded by the press of the time, now more than capable of matching its competitors and winning ‘Wheels’ magazines Car of the Year award for 1965. 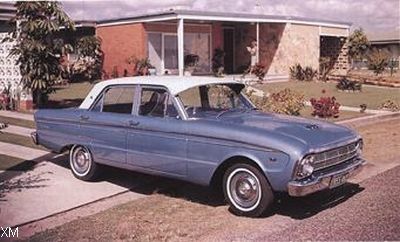 Also introduced with the XP was the first Fairmont, the prestige model in the Falcon range, fitted out with all the latest luxury features. 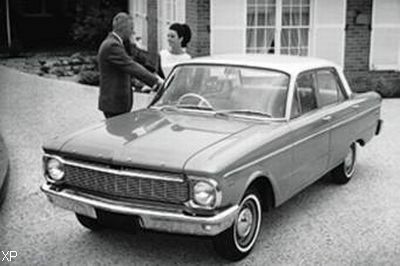 The XP was manufactured between March, 1965 and September, 1966. 70,998 were produced.